Most people are out of town still for the Holidays so it has been quite boring lately. Tiffany and me have just been sitting at home every night pretty much being a loser. Last night we decided that we were going to do something. So Tiff, Kaden, and me all we ice skating! I have never been before, so I was pretty excited! None of us were really that great but we still had a lot of fun. We tried doing tricks and stuff. You know how the figure skaters do their cool turns and stuff. Yeah that didn't work out too well for any of us. One day I will be able to do sweet tricks. Bet was that I would not leave there without a broken arm or something but fortunately I left with no injuries. Fun. 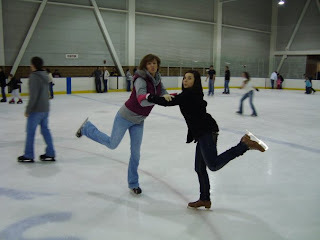 I want to take the girls ice skating. What is your email address Dani? Put it on my blog under the comments so I can invite you. Just tell Kara that boys are gross and she doesn't want to learn about anybody's sexuality! Oh my goodness! I haven't seen you forever! I hope you are doing good!That's awesome that you are working at the plasma center! It sounds like you'll do great!